“Sounds have no goal! They are, and that’s all. They live. Published by Oxford University Press in July 2010, this book is an invaluable chronicle from the inside of an exuberant time of artistic exploration and experimentation populated by now legendary figures such as John Cage, Morton Feldman, Lukas Foss, Cornelius Cardew, Maryanne Amacher, Terry Riley, Julius Eastman, David Tudor, and many others who were part of this under-known chapter of late 20th century musical avant garde. This Life of Sounds was released in paperback in Fall 2016. 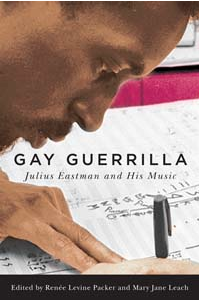 A collection of biographical and musical essays about composer-performer Julius Eastman, co-edited by Renée Levine Packer and Mary Jane Leach, was published by the University of Rochester Press, Eastman Studies in Music Series in December 2015.